even as we put our hope in you (NIV). This final portion of Psalm 33 is all about hope. Life is all about hope. From the first breath we take until our last gasp, life is all about hope. Life has no meaning or purpose if we lose hope. The essential question we must ask is where do you place your hope? All too often we place our hope in the things of this world, our resources, our ingenuity and the strength of our flesh. But the psalmist reminds us: No king is saved by the size of his army; no warrior escapes by his great strength. A horse is a vain hope for deliverance; despite all its great strength it cannot save. Time and again throughout history the little guy has won. 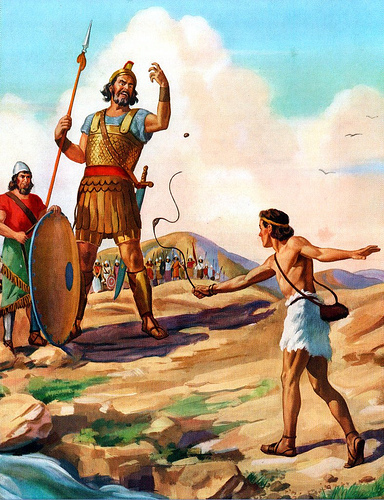 David defeated Goliath. The Viet Cong ousted the US Army. The Afghan rebels outlasted the armies of the USSR. Victory does not always go to the mighty. So the lament goes up, “How the mighty have fallen! The weapons of war have perished!” (2 Samuel 1:27). Where is your hope? Where have you put your trust? The psalmist reminds us to put our hope in the LORD. Leaders come and go; nations rise and fall. Human abilities wane. “The grass withers and the flowers fall, but the word of our God endures forever” (Isaiah 40:8). Our hope and our trust must be in God and in His unfailing word. When calamity strikes, those who maintain hope survive; those who give up hope perish. In stories of extreme survival over and over again this truth is borne out. Hope sustains the human heart, when food and water run out. When we put our trust in the LORD, we tap into a limitless supply of hope. Therefore: We wait in hope for the LORD; he is our help and our shield. In him our hearts rejoice, for we trust in his holy name. Response: This is our prayer. May your unfailing love be with us, LORD, even as we put our hope in you. In the name of Jesus—our source of hope—who defeated death, we pray. Amen. Your Turn: What are some sources of false hope? Why have you put your hope in God? he commanded, and it stood firm (NIV). But it’s not only God’s words that have this vast power. Our words—human words, whether spoken written or thought have enormous power too. Adam’s first job assignment was to speak words—to name the animals. Now the LORD God had formed out of the ground all the wild animals and all the birds in the sky. He brought them to the man to see what he would name them; and whatever the man called each living creature, that was its name. So the man gave names to all the livestock, the birds in the sky and all the wild animals (Genesis 2: 19-20). Strangely, God didn’t do what every parent does. He didn’t tell Adam what the animals were called. Adam told God their names. By so doing, God vested mankind with the power of language. Life is what we call it. Our words describe the world and give meaning to it. Through our words we bring order and make sense of the world around us. As a writer I am continually processing and attempting to make sense of this chaotic thing called life. I do it with words. From the beginning of time, by divine command that’s what we are called to do. We are to speak order into chaos— speak accuracy and clarity into this world’s muddled reality. With our words we shine the light of truth onto a situation. With words we write laws, administer justice and design government. With words we woo and romance and vow our love to one another. Our words create imaginary realms into which we can travel—words that transport. With our words we have the power to elevate the human spirit, or crush someone to the point of suicide. Finally, there is something innately prophetic about our words. What we think, speak and write is potent. It has within in it the latent ability to become reality. Therefore, we need to guard our lips. See James 3:1-12. The psalmist reminds us not only of the power of the word of the LORD, but also our own words. For he spoke, and it came to be; he commanded, and it stood firm. Response: LORD God, help me give careful consideration to my words. Today, may my words, whether written or spoken, be a creative force for good in Jesus’ name. Amen. Your Turn: How has God used your words for good lately? Are your words bringing order out of chaos? Strangely, God didn’t do what every parent does. He didn’t tell Adam what the animals were called. Adam told God their names. By so doing, God vested mankind with the power of language. Life is what we call it. Our words describe the world and give meaning to it. Through our words we bring order and make sense of the world around us. As a writer I am continually processing and attempting to make sense of this chaotic thing called life. I do it with words. From the beginning of time, by divine command that’s what we are called to do. We are to speak order into chaos—speak accuracy and clarity into this world’s muddled reality. Response: LORD God, help me give careful consideration to my words. Today, may my words, whether written spoken or thought, be a creative force for good in Jesus’ name. Amen. When calamity strikes, those who maintain hope survive; those who give up hope perish. In stories of extreme survival over and over again this truth is borne out. Hope sustains the human heart when food and water run out. When we put our trust in the LORD, we tap into a limitless supply of hope. Therefore: We wait in hope for the LORD; he is our help and our shield. In him our hearts rejoice, for we trust in his holy name. Response: This is our prayer. May your unfailing love be with us, LORD, even as we put our hope in you. In Jesus’ name, who defeated death, we pray. Amen. Was it God’s plan and purpose to have millions of Christian believers go to their slaughter in World War I? Many atheists purport that this is what we believe. Nothing could be further from the truth. We are responsible for our own actions. God does not cause war. Humans cause war and they carry it out. Why should we suddenly blame God for what we have engineered through our own dogged stupidity? Blaming God for our own arrogant idiocy is the pinnacle of irresponsibility, yet we do it all the time, both on a national and a personal level. Most often we are the author of our own disaster. We fail to pull back and change course before it’s too late. Response: LORD God, thank you for choosing me to be to be one of your people. Help me to live a life that is pleasing to you, my Father. You watch over me. You, O LORD are my inheritance. Amen.